I live in Portland, Oregon, and am happy to say that there are a variety of organic restaurants and delis available to the public here in Portland. One of these great restaurants is Papa G's Vegan Organic Deli on Division Street. Papa G's is great because it is not just a place for vegans, but also for those looking for organic food. They use compostable To-Go's that is good for the environment as well as green power. Their food is obviously the best part. Although the place is not large, it always seems to be full. They offer a variety of options on their menu, including soups, a full salad bar, hot foods, and also raw foods. 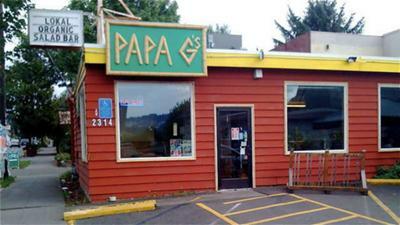 Papa G's also offers fresh juices and vegan burgers. This truly makes it a versatile place to eat. Papa G's is authentic organic because they strictly use only organic ingredients. They recently remodeled the place and from what I have heard they used only recycled paints! The place looks great. 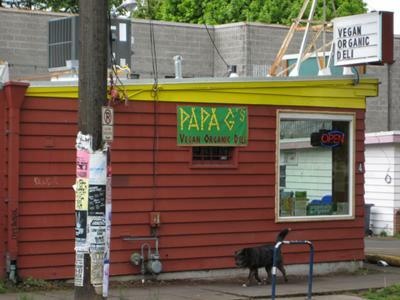 If you are in Portland, Oregon and you love eating organic foods, come check out Papa G's Organic and Vegan Deli. Join in and write your own page! It's easy to do. How? Simply click here to return to Organic Restaurants. My sister-in-law was in town a couple of weeks ago and she is a big vegetarian, organic, locally grown, etc. fanatic. I had heard of Grilla Bites and even walked past it a couple of times while considering eating there but had never actually done so. They serve all kinds of organic sandwiches, salads, and juices there and so when we were passing by with my sister-in-law after having mentioned interest in having lunch out we stopped in. It was great because the food was tasty and it was also healthy and they weren't too pretentious, which can really be a problem sometimes with these types of establishments. The best part is that my sister-in-law, who owns and runs her own organic restaurant in Burlington, Vermont, was able to chalk the lunch up to “market research” and pay for it out of her business account. If you are ever in Ashland, be sure to give “Grilla” a try, you will be more than glad you did! During my holiday in Portland, I visited Papa G's Vegan Organic Deli with my husband and we were very satisfied with it! You can get an amazing tempeh/amaranth burger or vegan Reuben for under $8.00, we loved the combination of flavors and textures. The 100% organic chilidog with Papa G's own homemade chili was great too, and really cheap! Our favorite item from their menu was the vegan burrito; it was huge and very substantial. We also ordered a side of avocado and nacho cheese sauce for it and I highly recommend the cheese sauce. Whether you pour it over the burrito or order their generous plate of nachos... it's hard to believe it's vegan and apparently they make it themselves! Overall we eat very well there, the service was good and we'll go back if we ever visit Portland, OR again. A family member of mine is a vegetarian and asked me to go to lunch with them. I was skeptical because I believed vegetarian was disgusting. a tofu steak with stir fried vegetables. The tofu steak was Teriyaki and it had the texture of fish. It was fantastic, I really did not think I had been eating tofu. Also, on top of the vegetables was this delicious lemon cream sauce. My only problem was that my tofu steak was too small, I wanted more of it when I had finished. Now, I am always up to go eat vegetarian, as long as the tofu is good! I am definitely giving the Green Wok the thumbs up!